Read a Japanese translation of this blog entry. The former vice minister of foreign affairs of Japan, Mitoji Yabunaka, wrote a column last month that appeared in a local Japanese newspaper in which he referred to Indiana as the most pro-Japanese state in America. To support this claim, he cited the fact that many major Japanese companies, including Honda, Subaru and Toyota and many automotive component companies, have invested heavily in the Hoosier state and its workforce. According to statistics from the Indiana Economic Development Corp., more than 280 Japanese companies operate across Indiana, and they employ more than 58,000 Hoosiers. 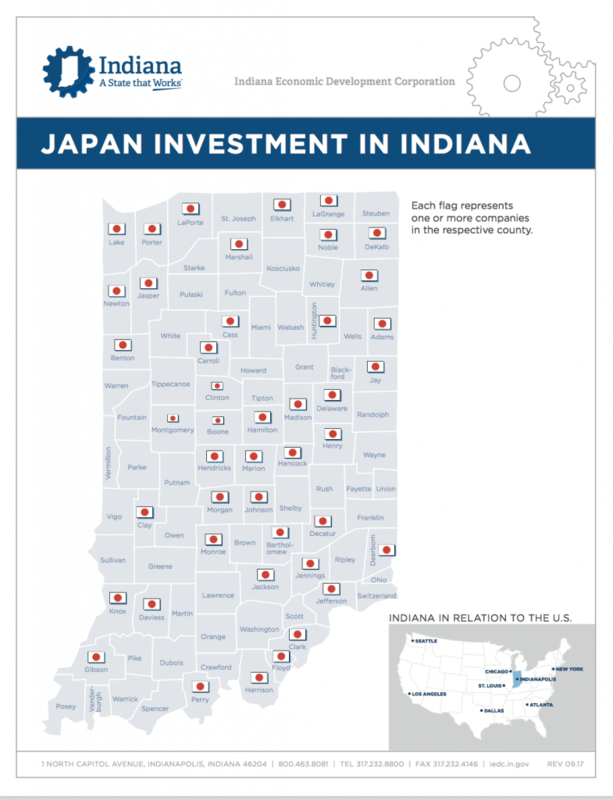 Among all U.S. states, Indiana has the largest amount of Japanese investment per capita. Last year, Indiana exported $1.6 billion of Hoosier-made goods to Japan, which is currently the state’s fifth-largest export partner. Many Indiana-based companies, including Eli Lilly, Cook Medical, Cummins, Urschel Laboratories and Zimmer Biomet, have operations in Japan. More than 280 Japanese companies operate across Indiana, and they employ more than 58,000 Hoosiers. As a result of Japan’s increasing impact on the Hoosier economy, U.S. Vice President Mike Pence made several trips to Japan while he was governor of Indiana, and current Indiana Gov. Eric Holcomb recently returned from leading a delegation of Indiana business leaders and economic development officials on a trade mission to Japan. And if that’s still not enough evidence to support the winning Indiana-Japan connection, I might also point out – as the vice-minister did in his article – that a Japanese driver, Takuma Sato, captured the checkered flag at this year’s Indianapolis 500! One connection the former vice minister didn’t make in his story, but that definitely demands telling, is the historic, bridge-building relationship between higher education in Indiana and Japan – a relationship Indiana University has played a major role in building for more than a century. Indeed, it would be far from a stretch to call IU one of the most pro-Japanese universities in the U.S., especially when one considers the longstanding ties between Japan and the state’s flagship university. IU’s first alumnus from outside North America, Takekuma Okada, was an alumnus of Waseda University and earned a master’s degree at IU in 1891. Another international IU alumnus, Masuji Miyakawa, graduated from the Indiana University Law School in 1905 and was the first known Japanese student to be admitted to the bar in the U.S. He was also a civil rights pioneer who fought against the racial segregation of Japanese in America in the early 1900s, and he spent many years promoting better understanding between our country and Japan. Yet another early IU Japanese alum was Paul Isobe, who earned a bachelor’s degree in chemistry at IU in 1909. He went on to become a prominent industrialist, helping develop the soybean processing industry and chemical industry in Japan. 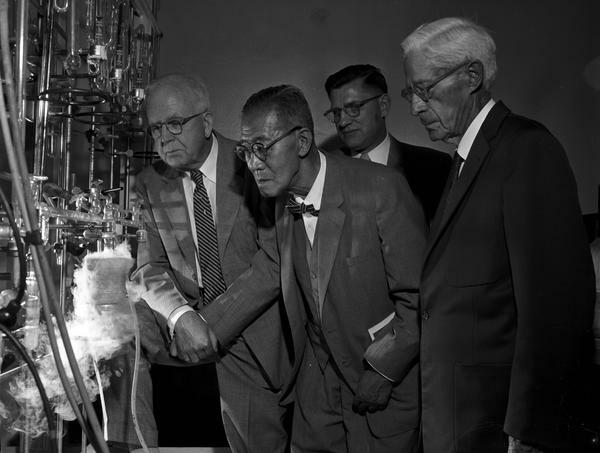 Paul F. Isobe, second from left, a leading Japanese industrialist and chemist and a 1909 graduate of IU, inspects an IU chemistry laboratory in 1959 with two of his former chemistry teachers. Photo from IU Archives collection. Many of IU’s Japanese alumni are members of the Japan Chapter, IU’s oldest international alumni chapter, which celebrated its 50th anniversary in 2014. The chapter was founded by Kaoru Ando, who served as its president for nearly two decades. Ando also co-founded Fujitsu, one of the world’s leading computer manufacturers, which is sometimes referred to as the IBM of Japan. At IU, he is honored by the Ando Scholarship, which provides opportunities for IU students to study in Japan. A celebration of IU’s Japanese alumni would be on order for Wednesday evening here in Tokyo, but first up for IU President Michael A. McRobbie and his fellow delegation members was a meeting with the directors of the Japan Foundation. 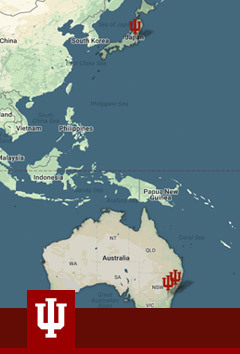 Founded in 1973, the Japan Foundation is the country’s only institution dedicated to fostering cultural exchange programs throughout the world. As part of its mission, it seeks to deepen mutual understanding between the people of Japan and other nations. The meeting provided an opportunity for the IU contingent and their counterparts at the Japan Foundation to discuss their mutual interest in increasing student and faculty mobility between Indiana and Japan. It also allowed delegation members to share several of the university’s most notable accomplishments over many decades in the area of Japanese studies, as well as its goal to become the leading center in the Midwest for in-depth study of contemporary Japan and, more broadly, East Asia. Members of the IU delegation discussed increasing student mobility between IU and Japan at a meeting with leaders of the Japan Foundation. At the Japan Foundation headquarters in downtown Tokyo, IU Vice President for International Affairs David Zaret and former U.S. Ambassador to Poland and IU School of Global and International Studies Dean Lee Feinstein spoke glowingly about the work of IU Bloomington’s Department of East Asian Languages and Cultures, the central academic unit at the university for the study of all aspects of East Asian language, civilization and society. IU has 700 students studying East Asian languages, including more than 300 students taking Japanese. The department offers a wide range of courses on East Asian literature, history, politics, religion and art, and it continues to expand its teaching and research expertise on contemporary U.S.-Japan relations in an effort to promote a deeper understanding of Japanese politics and culture. Fittingly, joining the delegation for today’s meetings was Adam Liff, an assistant professor of East Asian international relations security studies in the School of Global and International Studies. Liff is spending six months at the University of Tokyo studying, among other areas, U.S.-Japanese relations, regional security issues and the effect of recent political tensions on Sino-Japanese trade and investment. He is also one of many IU faculty from the Department of East Asian Languages and Cultures and other IU schools and departments who constitute the East Asian Studies Center in Bloomington, which has linked the university’s East Asian area specialists to the needs of business, education and government since 1979. The leaders at the Japan Foundation, with their increasing interest in “policy-driven scholarship,” responded enthusiastically to the idea of IU’s School of Global and International Studies serving as a hub in the Midwestern U.S. – which is where much of Japanese investment is now focused – for the study of modern Japan and U.S.-Japan relations. Likewise, foundation members sounded their support for furthering student and faculty exchanges and research collaborations between IU and Japan’s leading educational institutions. That sentiment was echoed later in the day Wednesday as President McRobbie met with the new U.S. ambassador to Japan, William F. Hagerty IV, and then with the leaders of Japan’s Ministry of Education, Culture, Sports, Science and Technology, an organization dedicated to internationalizing Japanese universities and promoting greater student mobility. The IU delegation’s all-too-brief time in Tokyo ended with a rousing celebration of IU’s Japanese alumni and its half-century-old Japan Chapter — which, if Wednesday night’s event is any indication, isn’t slowing down anytime soon. The celebration was nothing short of a home run – in more ways than one. President McRobbie used the occasion to observe the 95th anniversary of the IU baseball team’s 1922 visit to Japan at the invitation of Waseda University. As chronicled in a wonderful IU Archives story — part one and part two are available on the IU Archives website and are required reading for any IU baseball fan! — the team’s trip fostered friendly relations between Japan and Indiana and promoted international understanding during the early part of the 20th century. It also served as a huge hit with enthusiastic crowds both in Japan and back home in Indiana. At IU, classes were dismissed early and 3,000 people — including IU’s 10th president William Lowe Bryan, who played on one of IU’s earliest baseball teams — went to the train station to see the team off. On one side of Wednesday evening’s event space, a series of photographs from the IU Archives collection were displayed for IU Japan Chapter alumni, who also enjoyed seeing McRobbie drive home the commemoration by delivering an authentic red-and-white IU baseball glove to Shinoda Toru, dean of the Center for International Education at Waseda. 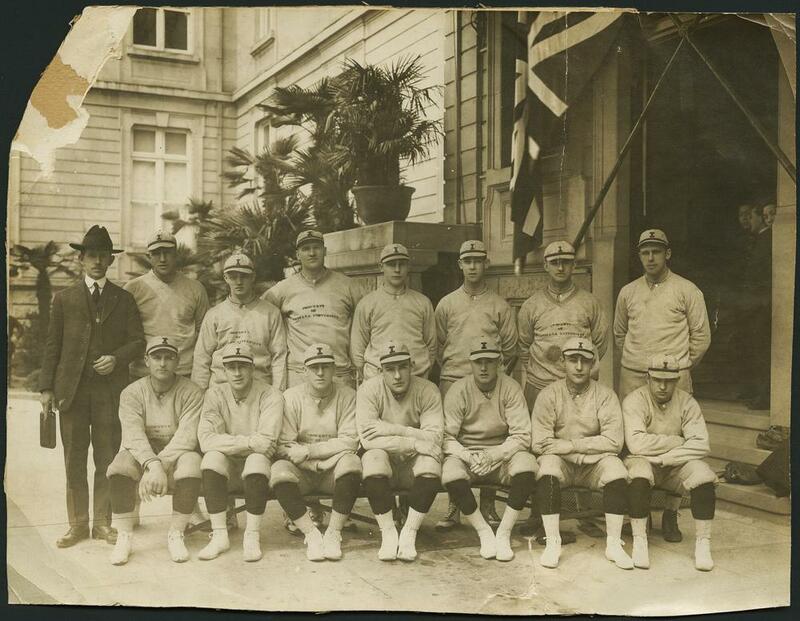 The IU baseball team was a huge hit on its 1922 trip to Japan. Photo from IU Archives collection. As he typically does at international alumni gatherings such as this, McRobbie provided an update on recent record-breaking progress at the university for the Japanese alumni, many of whom hadn’t been back to Bloomington for several decades and expressed excitement at seeing the new schools, facilities and major academic programs that have come online in the past several years. McRobbie also presented two of IU’s most prestigious international alumni awards. He awarded the Thomas Hart Benton Mural Medallion, given to individuals who have achieved a level of distinction in public office or service and have exemplified the values of IU, to distinguished business leader Hideo Ito. After earning a Master of Business Administration from IU’s Kelley School of Business in 1977, Ito went on to serve the Toshiba Corp. for a remarkable 36 years, including as chairman and CEO of Toshiba American Electronic Components. 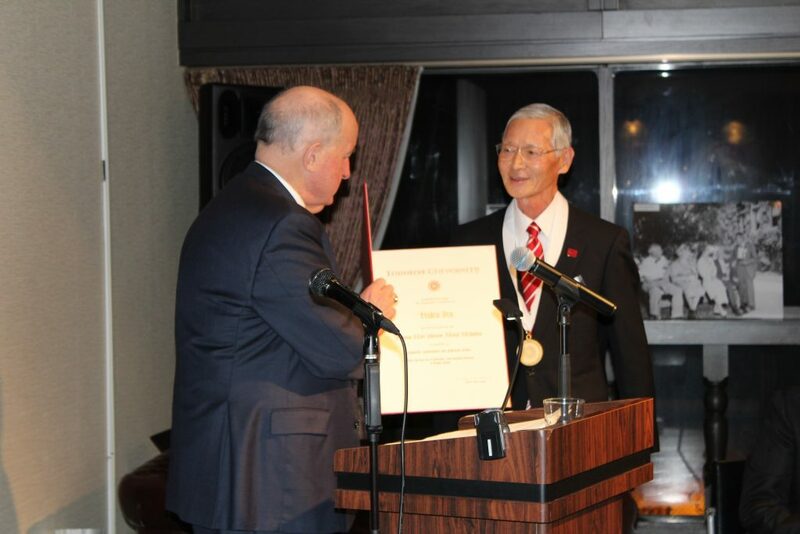 Later, McRobbie and Vice President Zaret, whose office organized the trip to Tokyo, delivered the Distinguished International Service Award to Yasunori Hattori (MBA, IU Kelley School of Business, 1969), a former manager at IBM’s Asia Pacific Service Corp.
To conclude the evening, IU Jacobs School of Music alumni Robert Ryker and Johann Schram Reed, who delivered such a powerful performance of Brahms’ Ein Deutsches Requiem on Tuesday night at the Tokyo Metropolitan Theatre, led attendees in a rousing sing-a-long of the IU fight song. It was a wonderful coda to the IU delegation’s busy and productive time in Japan, which once again proved that even when the spirit of IU might seem like it is thousands of miles away, it is always easy to catch. Distinguished Japanese business leader and IU alumnus Hideo Ito received the Thomas Hart Benton Mural Medallion in recognition of his international achievements. 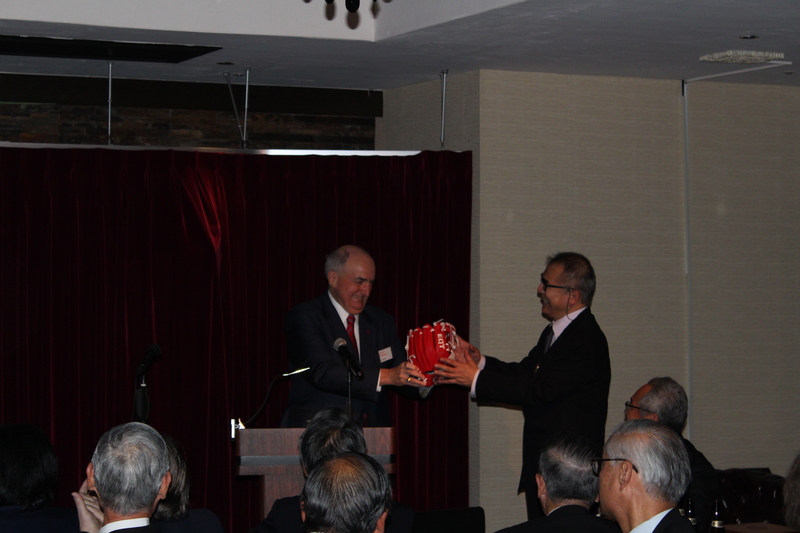 To commemorate the IU baseball team’s 1922 trip to Japan, President McRobbie presents an authentic IU baseball glove to Shinoda Toru, dean of the Center for International Education at Waseda University. Members of the IU delegation celebrated the university’s Japan Alumni Chapter, now 53 years old.